Consider yourself a DIY traveler but need a head start? Traveling to Cuba is unlike vacationing in any other Caribbean island. That’s what makes it worth the journey. Long isolated from the rest of the world, Cuba is a “work-in-progress.” As a developing nation, Cuba can be challenging to navigate. I~ Dared Travels can help even the savviest of road warriors unravel the mystery of visiting this uniquely inspiring island. 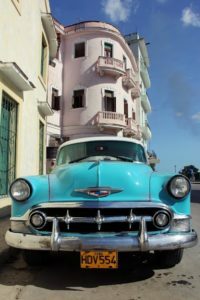 With an intriguing art scene, vibrant culture, abundance of historical sites, and picturesque landscapes to take in, Cuba has so much to offer to the adventurous traveler. But, where to begin? I~Dared Travels can eliminate the question mark. Begin with us. Fees for our travel support start at $300 per person/couple. Total costs are dependent on the length of stay, number of travelers and extent of services required. For charter flights, the cost of airfare, visa, Cuban exit tax, and baggage fee will be calculated into arranging initial travel to the island. Please note: airfare prices vary due to demand and season. Luggage that exceeds weight requirements for travel to Cuba will be the responsibility of the individual traveler. A charge of $2.00/lb exceeding the 44 lbs limit will assessed at the ticket counter and is payable in cash or by credit card. Support with arranging flights via commercial airlines is available. Each traveler must meet one of the twelve legal categories approved by OFAC for travel to Cuba.